It's official, Christmas crafting is in full swing. Lots of great Christmas crafts are appearing around the web such as here, here, and here. And to officially kick off Christmas crafting on Zakka Life, I'm sharing how to make this felt sphere ornament. 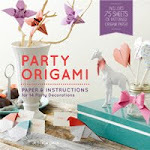 It was inspired by one of those paper party decorations that fold into a ball. I just took that idea, scaled it down and used felt instead of paper. Enjoy. 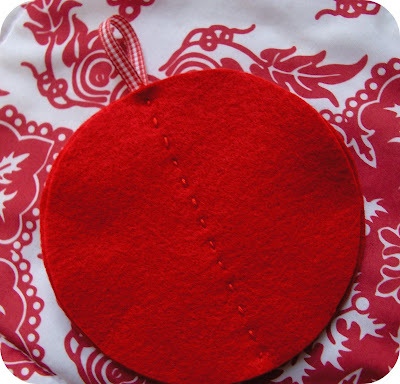 6 Felt circles - The circles I used are 4 1/2 inches in diameter. I do not recommend using anything smaller than 4 inches. Line up all six circles on top of each other. 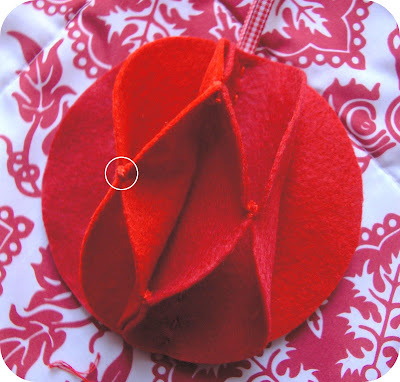 Fold ribbon in half and place in the center of the circles (three in front & three in back). Stitch down the center sewing the ribbon to the felt and at the same time sewing all six felt circles together. Refer to picture. From a top view the ribbon should look like this. In this picture I only have two circles on each side. Your ornament should have three on each side. Pull the edges of the first circle together. 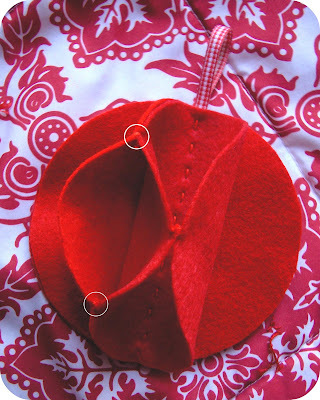 Stitch in place where you see the white circle in the picture. Make sure to conceal your knots in the inside. Click on picture for a larger view. Pull the next circle flap on the left hand side up to the center. Stitch together where you see the white circles in the picture. This will be the pattern for the entire sphere. 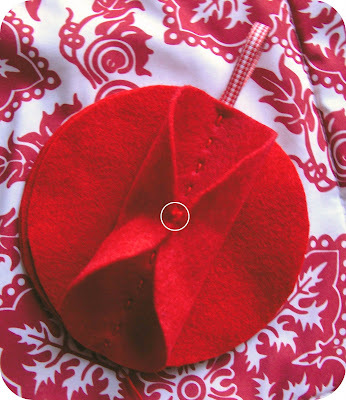 Pull the next circle flap from the left hand side and stitch to the center of the last flap. Stitch where you see the white circle. Continue with this pattern(one center stitch, two top and bottom stitches) until you've created a sphere and every circle flap is attached to each other. Done. To make this ornament more decorative you could sew on a pearl at each place you sew the circles together. If you wanted to make the ornament more full, you could use eight circles. Yet another totally brilliant idea! I can't even tell you how much I love this project. Thanks so much, I see lots of these in my future! Yup - I concur -- simple yet brilliant. I look forward to many more spectaular Christmas ideas. beautiful and I need to make these by the dozen to augment the ball ornaments. Great project! Thanks for sharing it with us. My Daughter will actually be able to make these! Simple yet so pretty! 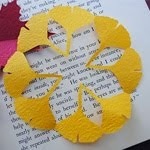 Another wonderful craft idea! These are lovely! Thanks so much for the idea. I've been trying to find toddler-proof ornaments and I think these will be perfect. thanks for sharing this great tutorial! This is a very nice blog... I can see that you put a lot of heart on your posts, that's why I'm sure I'd visit here more often. Anyway, if you have time, you can visit my blog as well, Abstract Art Painting / Buy Abstract Art. See yah! 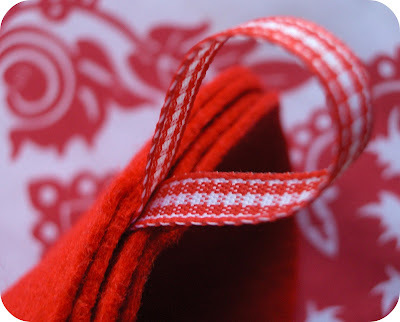 I've been looking for an easy Christmas project to use up some felt lefovers and this would be ideal, thank you for sharing. Lovely! Kid and catproof too. You take such nice pics... am admiring your background fabric as well. Very nice!! I am totally including this in my holiday craft ornament party! Thanks!! I'm all over it! Love this idea! Fantastic! Very simple but very elegant! I just discovered your blog. You are very creative. Love the tea tin cuff bracelet. oooo! so lovely! i think i will make one to hang in my doorway. wouldn't that be nice? thanks for the tutorial! gotta make this..!!! Aargh! I have tons of craft ideas from you I haven't tried and this came!! I need 34 hours in a day! Wow, that's so beautiful and simple. I'll have to have an ornament making party! :) Thanks for the tutorial. This is a great ornament - i was planning to make my sister some baby- and pet-safe ones (or rather tree-crash-safe) for the holidays and these will do just dandy! Thanks!! wow! very beautiful. thanks for inspiration! thanx so much for sharing, this is so brilliant!!! Going to post about it!! Love this idea, posting it fri. to have others come see it outstanding! I could see how this would be a great project for the road....or latenight TV. Brilliant! Seriously. I'm a little slow- did you do the center stich with a machine or by hand? I tried myself and added (as you suggested) some beads. Ooo. I really like this. 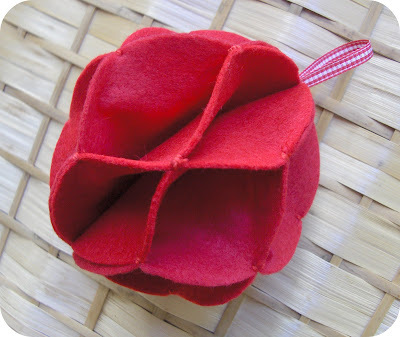 I just did an article on ornaments: http://www.favecrafts.com/Ornaments/24-Ornaments-to-Give-or-Keep-for-Yourself but I didn't think of felt! Just stopping in for the first time. 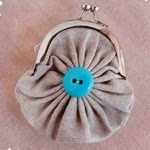 I love your ideas and your style, practical, simple, cute, inexpensive...love it! This is great. I always sew ornaments with my students each December, but after 17 years of teaching I was desperate for a new one. This is perfect! Thank you. Thank you! I cannot wait to try these baby-proof baubles! Thanks for sharing! This is gorgeous! Lovely tutorial. I will be making some of these. Thank you!! Belíssimos, amei os trabalhos e idéias.Abraços. That is so pretty! I love felt, it's so, so cozy. Thanks so much for this, I'll be linking. Love this! So easy and beautiful! Oooo...I have to try this! Love it! Thanks for the tute. I have been looking for something to do for people in our Sunday school class. This is perfect!!!! I So want to try this! Thank you for sharing.! Nice. Let me try it with paper. Thank you so much for this idea! I made one out of green felt pieces in triangles and tied with red thread. Looks like a little chirstmas tree. Love it! Hola. No entiendo nada de ingles pero con las fotos me vale para hacer estas preciosas bolas de Navidad. Very nice...thank you for sharing.
.: Thank you for the post-your DIY CHristmas ornaments is simply pretty and brilliant!~~ ^,^ :. Thank you for thatt beautiful idea. I tried it out, it's perfect. 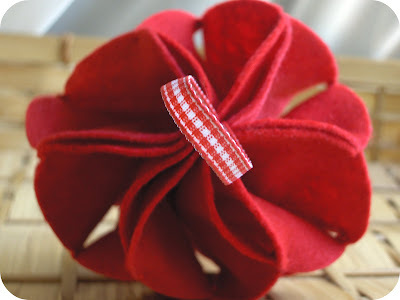 Now I'll will give to my sewinggroup, we are having an exchange with little things for christmas. That is gorgeous! I'll be making a few of those to go on my tree this year! Oh...and I did sew a pearl at each intersection. Looks adorable. Adorei a idéia,trabalho muito com feltro,vou fazer e postar no blog! !bjos,abrigada !!! great. simple but very beautiful. i set a link to this post. i hope you'll agree. This is so simple & brilliant! A wonderful craft to do with my daughter, thanks! Wonderful tuturial, thanks for sharing. I used my sizzix circle die to cut out the circles, worked perfectly. i love this, it is faster than most projects but in bulk is still time comsuming. but i had an idea to add a little glitter. just on the edges i put some glue and then glitter. it looks great. thanks so much for the craft idea! can i request one felt ornament for christmas? =oP danny and i are hoping to get a christmas tree for our place. can i request one felt ornament for christmas? =o) danny and i are hoping to get a tree for our place. So simple, but so cute! Putting it on my list . . . my ever-growing list . . .
That it such an awesome idea ! Love this project idea! I just made one and posted about it. Thanks for the inspiration. This was not that difficult at all! LOVE this! I'm going to include it in a post and link back. Thanks for the idea and tutuorial. hello... thanks for the lovely idea. I've made some and posted it on my blog with a link back to here. off to explore more of your wonderful ideas. We made these for a church craft day this past Saturday and everybody loved them. Thanks! Gracias por las explicaciones. Es genial y quedan preciosas. my 10 year old is going to love making this! I was inspired by this post and made similar ornaments out of paper. Love it! I think I'm going to try it with fabric. We'll see how it turns out :) Thanks for the tutorial! I was fascinated when I saw this! Yesterday I finally made one ornament and it turned out wonderful! I used a much longer piece of ribbon and let the long ends (20 cm each) hang out on the underside of the ornament. After finishing the sewing, I made a bow with the long ends. I'd like to invite you to visite my italian blog, bye bye Laura! Thanks for this ornament. It was super easy. I made one and posted about how easy it was for me and others to make it. Ficou muito legal. Foi uma brilhante id'eia. Fa'cil de fazer, econ^omica e bonita. Adorei. No natal deste ano certeza que vou fazer. Parab'ens! Cute idea, can't wait to try it. I take your pic' and add a link from my blog to yours ! thanks a lot for that great idea ! i made some of these for my tree, but i also made some that were about 10-11 inches to hang from the ceiling. i love felt, it's my favorite craft medium, and i wanted the look of felt instead of paper. but i was afraid they would not store well, so where you would join the two pieces, instead of sewing them together at the edge, i added a tiny snap as close to the edge as possible. then when i took them down to put away, i unsnapped them, and they store flat. i'm hoping they work out okay for next year! Every year I make my mum some decorations for her tree. Last year it was mini knitted stockings - for this christmas these are perfect! Thank you. Wanted you to know that I blogged about your tutorial! Love it..Thank You! So cute! Thank you for the tutorial! This is lovely. I'm looking for ornament inspiration and this is right down my alley - thank you! Gorgeous! Have featured it on my blog today..
Really great ornament! Thanks for sharing. Can't wait to make one! wow! It's beautiful and handy with small chindrens at home! wow this would be a great piece for decorating my Christmas Tree this year. Just very eager to make this one very beautiful. I have been looking for some lovely ornaments that my 18 month old boys can't break! I am definitely going to make these! I have also pinned this in Pinterest. Já fiz e coloquei um link no meu blog. My children watched me make this then all had to do their own. My 8 and 9year old, who know their way around a sewing project, were able to complete with only a few directions from me. My 6 year old, still honing his fine motor skills, needed my hands on assistance. All of them turned out great! Each child added their own creative flare. I kept mine simple. It was a great way to spend a Friday night. love this i am going to have a go this weekend thank you so much! I definitely see more of these in my future. Thank you for the great ideas for christmas! so cute, gonna try this right away. Awesome. I am trying this right now! There are no words to describe how much I love this project, so I'll simply say "well done"! Love the felt ornament pattern. Tried it with two circles of Christmas cotton print fabric, bonded together, and used 8 circles. Trimmed with little sparkly beads. Pet-proof, too! Thanks so much for the idea.